[Ken] visited our site looking for case modding stuff a little while back, but more importantly he came back to show off his latest project. Using a jewelry box found at our favorite place, the thrift store, he converted it into a 2.5 inch USB drive enclosure. Almost instantly he found that this particular jewelry box is a perfect fit for a 2.5 inch SATA laptop drive. Taking that as a sign he whipped up some acrylic mounts and cut some holes for power and USB . The electronics are provided by another enclosure with a dead drive, again acrylic is used to insulate the drive from the decorative metal box and some rubber washers were used to help cancel out vibrations and noise. The end result is a classy looking 150gig usb drive that looks nice on the desk, and a little reminder that if your not hitting up your local thrift / second hand stores, you could be missing out on some real gems. Dollar stores/Hobby stores have some good stuff for cheap too. He is also selling it for $50 apparently. 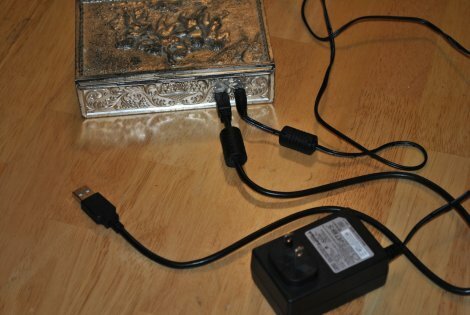 If you’re just going to just make a cheap external hd box, just buy a cheap one designed for this off the internet and leave the jewelry boxes for who people who want to put jewelry in them. dollar store enclosures ftw! this one is like the old rusted cadillac of them. still going strong. btw, who buys second hand HD’s? Oh. My. God. Is Sandbenders becoming real…? Yes, let’s all follow J Harton’s example and NOT make stuff on the hacking site. Let’s just tell each other stories of how great it was to purchase a thing. I found a Chinese usb hdd with a laptop ide hdd in it the other day at the salvation army. It said goofy crap like super quick fast mega turbo hard disk on the box. It also informed me that it was also delicious.?!(Wut?).. Got it for fifty cents and it worked. Ubi de Feo wrote a comment on OPEN Power (Prototype 1). Paul Versteeg wrote a comment on project log U1LiUPSRPi Python Code. John Sutter liked Desktop printer remake to textile & wood. trigotoram liked Goniometron the Flexinator. trigotoram liked Cyborg Eyeball Project. lmckeega wrote a comment on Sawppy the Rover.